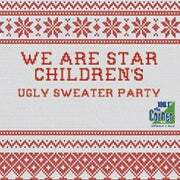 Get your holiday rock on at the Jefferson Theater and help a great cause. 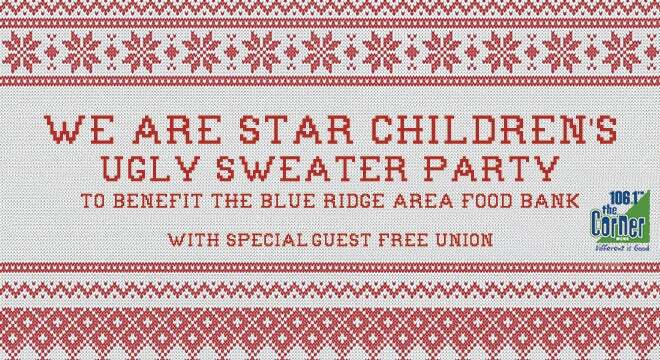 $2 from every ticket purchased will go directly to Blue Ridge Area Food Bank. The BRAFB provides food to 114,000 neighbors each month and is the largest organization alleviating hunger across central and western Virginia. One donated dollar provides 4 meals to our neighbors in need! We Are Star Children is a 7-piece "adventure pop" band from Charlottesville, VA. They veer in and out of conventional rock/pop arrangement: horn and synth cascade over a surging rhythm section, brazen enough to share lead with the advancing wall of rich harmony vocals. In their recordings and live shows alike, they continually dance with beauty and mayhem, occasionally spinning into a contemplative waltz or tip-toeing down an eerie alley, but ultimately whipping the crowd into a full froth. They frequent debaucherous fundraisers, host homegrown shows in bookstores, and bring down the house whenever they appear on stage. Free Union is a Charlottesville-based collective helmed by Michael Coleman (vocals/rhythm guitar) and Rob Dunnenberger (drums). The collective’s first EP, produced by Devonne Harris and Adrian Olsen, features music and vocals by Carrie Coleman (background vocals), Parker Hawkins (bass), John Markel (bass), and Butch Taylor (keyboards/background vocals). The history behind the collective’s name gives context to its message. Free Union, Virginia—originally named Nicksville after a free African American blacksmith—sought to unite people of all races at a time when the country was inherently divided. These principles of inclusivity are the underpinnings of this collective. Free Union brings people, musical styles, and ideas together to inspire a message of unity. You will get that sense from lyrics like If I could push a bit more, maybe we’d come out as equal. ‘Cause love is not dead; it’s just missing all of the people (“Good Day to Cry”). Free Union’s goal is to deliver good music that is a true representation of its members and where they come from. For that reason, the collective’s sound is not distillable. Its ever-evolving music is rooted in soul and incorporates rhythm and blues, rock, and pop into its sound. The hope, according to its front man, is that “when you hear it, when you feel it, you won’t be able to keep from moving” and that “you’ll wake up the next day with it still in your mind.” The music will move your body and your heart; it will keep you thinking about what it will be like to one day have it all in the free world (“Free World”).